Gothic Revival architecture originated in England during the second half of the eighteenth century. This style came to prominence in the United States in 1832 with Alexander Jackson Davis’s design of Glen Ellen, a palatial home in Towson, Maryland. One of Davis’s contemporaries, Andrew Jackson Downing, promoted Gothic Revival with the publication of Victorian Cottage Residences and Architecture of Country Houses, which popularized the style in rural areas. The first American Gothic Revival buildings were made of stone and suggestive of medieval European castles, with battlements, pinnacles, parapets, and quatrefoil windows. Eventually, structures were built of brick or wood, and many of the highly decorative architectural elements fell by the wayside. The steam-powered scroll saw allowed for the mass production of lacy ornamentation that became known as gingerbread trim and gave rise to the substyle known as Carpenter Gothic, characterized by steeply pitched roofs, pointed arched doorways and windows, and single-story porches. The majority of Gothic Revival architecture in Mississippi can be found in houses of worship. One of the earliest examples is St. Mary’s Basilica in Natchez. Construction began on the building in 1841, making it Mississippi’s oldest Catholic structure still in use. The exterior is notable for its spindle-like spires and tall arched windows. Its elaborate interior, completed in the 1850s, includes magnificent stained glass and an ornate altar. 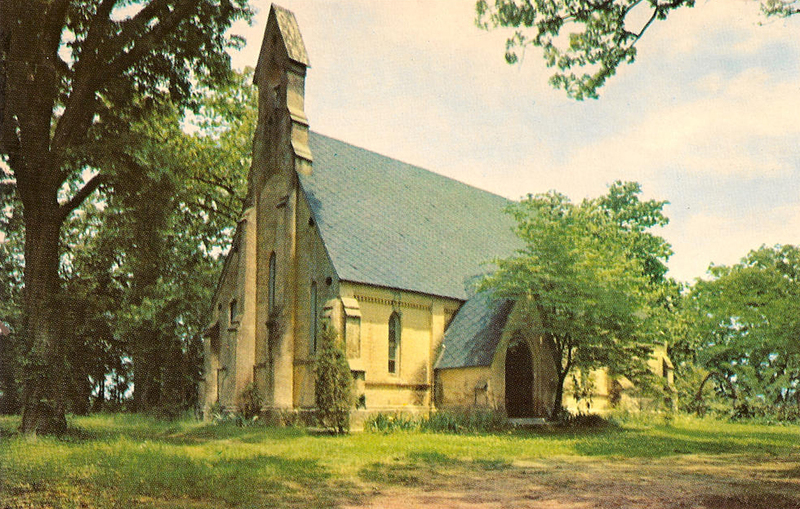 Designed by British architect Frank Willis and modeled after thirteenth-century rural English churches, the Episcopal Chapel of the Cross in Madison County was consecrated in July 1852. Its bell tower and steeply pitched roof are classic Gothic Revival elements. Two Gothic Revival buildings, the Sisters of Mercy convent at St. Francis Xavier Academy in Vicksburg and the Sacred Heart Catholic Church in Rodney, were built in 1868. The convent, which is listed on the National Register of Historic Places, is a four-story brick structure with multiple chimneys. Today it is one of five buildings that make up the Southern Cultural Heritage Complex. Sacred Heart Catholic Church is a simple wooden Carpenter Gothic structure with an arched doorway and windows. Sacred Heart was moved to Grand Gulf Military State Park in 1983 and now serves as a nondenominational Confederate Memorial Chapel. One example of residential Gothic Revival architecture is Manship House in Jackson. Built in 1857 by Charles Henry Manship, Jackson’s mayor during the Civil War, this one-story frame house with a steeply pitched roof was patterned after a design from Downing’s Architecture of Country Houses. Manship added floor-to-ceiling windows and a gallery that bisects the house, thereby improving ventilation. The Manship House has been restored and is now operated by the Mississippi Department of Archives and History as a museum. Another 1857 home, Cedarhurst in Holly Springs, was the residence of writer Sherwood Bonner. The house has a balcony with an iron lacework balustrade that was made at a local foundry. Its multiple chimneys, finials, and gingerbread ornamentation on the gables and the archways over the front porch are characteristic of the Gothic Revival style. The intricate decorative details of residential Gothic Revival fell out of public favor at the end of the nineteenth century, and residential architecture moved toward the Queen Anne style.